In the great old US of A, lightweight motorcycles have traditionally garnered little respect – though that is changing with the recent focus of major manufacturers on developing modern, exciting motorcycles in the less than 500cc class. Still, while the 250cc cruiser market may be almost as minuscule as the displacement in the United States, this class of cruiser shouldn’t be ignored. 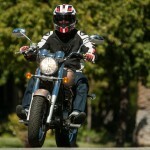 World-wide, the class carries much more importance thanks to tiered licensing and tariffs on large-displacement motorcycles. Additionally, the 250 class is also extremely price conscious, challenging manufacturers to make the tough decisions to build a quality, desirable motorcycle for a diminutive MSRP. 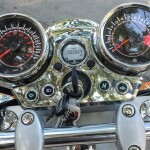 This is the environment that spawned the Hyosung GV250 Aquila. 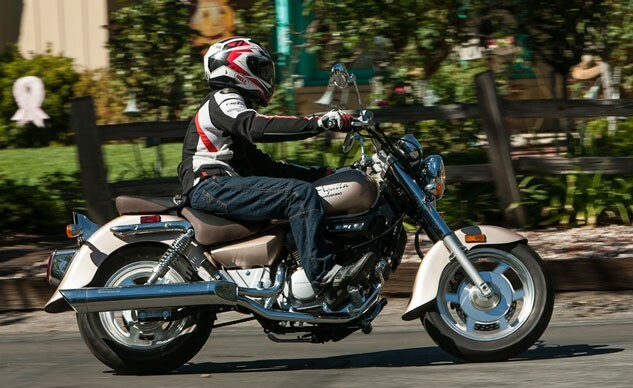 At first glance, the GV250 looks like a full-sized cruiser, and its 59.7-in. 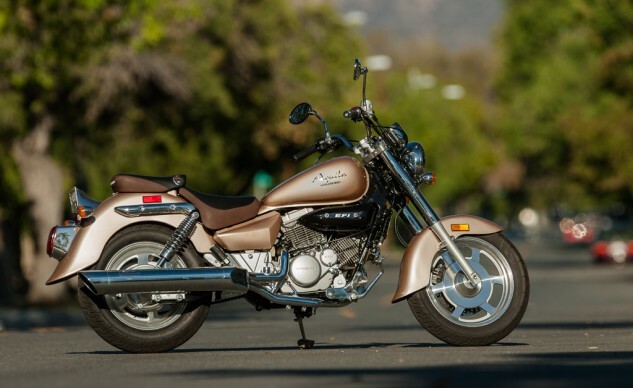 wheelbase surprisingly puts it in with bikes like the Harley-Davidson Street 750 and the Honda CTX700N featured in our Midsize Post-Modern Cruiser Shootout – bikes costing a little less than double the GV’s $3,999 MSRP. So, Hyosung is shooting for something bigger than mere 250 cruising. Does the Korean company pull it off? 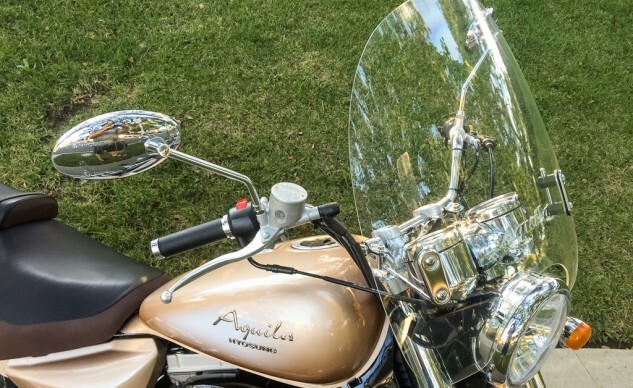 The Aquila offers big-bike looks at a small-bike’s price. 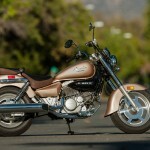 The GV250 is powered by a 75° 249cc air/oil-cooled V-Twin. So, don’t expect the tractor-pull torque of a bigger engine, but that’s fine and compares favorably to the other 250cc cruisers, the Honda Rebel and Star V Star 250. Newer riders are the target for this bike, Stateside. The power available off the line is unintimidating, though it does require careful modulation of the clutch lever – a process complicated by a friction zone that begins almost as soon as the lever leaves the grip. Since there’s minimal flywheel mass to cover clumsiness, a GV rider will quickly learn smooth clutch releases or spend a lot of time restarting the engine. Once underway, the short gearing provides enough acceleration to easily leave all but the most aggressive traffic behind – just remember that the shift from first to second needs to happen pretty quickly because of its short first gear. Some vibration is present at high rpm, but it never becomes oppressive. 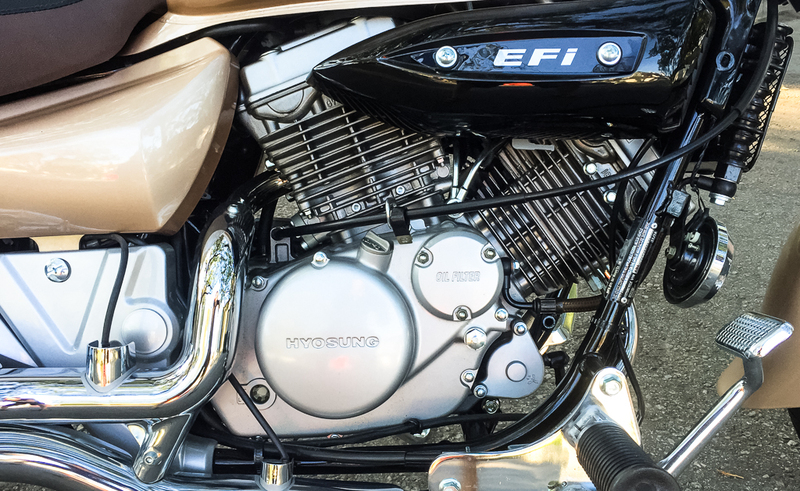 The GV250 comes equipped with EFI instead of carburetors like quarter-liter cruisers from Honda and Yamaha, and the fuel metering is better than that of some, more expensive cruisers I have ridden. Now, I know that displacement and the increased engine braking associated with larger V-Twins plays a part in this, but tasks that can flummox engines with less exacting mixture – the old on-off-on-throttle test – leaves the GV completely unfazed, as does holding a neutral throttle at low engine speeds in traffic. These characteristics make the GV a good introduction to motorcycling for new riders. The GV250’s engine is pretty nice looking piece. 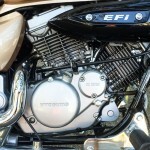 The EFI performs predictably in all the throttle situations I encountered. On the exhaust headers, the oxygen sensor wires rear their ugly heads. 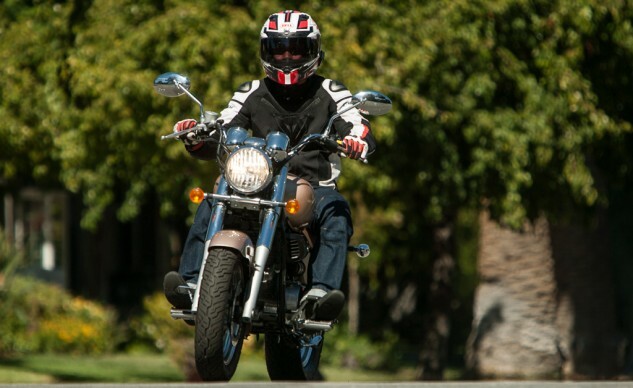 Although some might be hesitant to take a 250 on the interstate, the Hyosung can hold its own on the superslab, accelerating up to 70+ and feeling like it still has more on tap, meaning the GV250 could be a decent commuter. One quibble is the almost impossible to read numbering on the speedometer – unless your speed limit is in kilometers. The white outer numbers show the kph, while the dark red (on a black background) inner numbers are for mph and are impossible to read in any lighting condition other than direct, unshaded sunlight. When the time comes to slow down, the 275mm disc and two-piston caliper up front provide enough braking power to stop quickly if necessary – though they offer little feel. 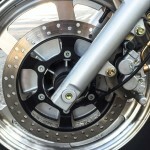 The rear brake is functional and is a reminder that some bikes still come with drum brakes. For years, one of my beefs with bikes directed towards new riders has been their weak brakes. I believe they teach ham-fisted brake application that must be unlearned when the rider moves to a bike with better brakes. 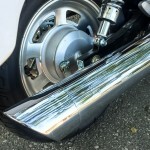 However, the soon-to-be ubiquitous ABS will lower the stakes of relearning braking technique. It’s too bad the Hyosung doesn’t at least offer ABS as an option. Offering non-intimidating power delivery, the GV250 is a friendly mount for newer riders. The wide, slightly pulled-back handlebar offers plenty of leverage to initiate turns, and when it comes to handling, the GV250 is a friendly companion, easily responding to rider input. Riders of shorter stature than myself may feel the reach to the grips is a tad long. Rotating the handlebar in the clamps could help with this issue. 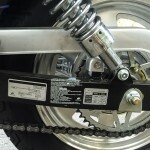 The bargain suspension components do an adequate job of protecting the rider from road jolts, although it tends to be a bit harsh over choppy bumps, as is common with the budget suspensions in this class of cruiser. When ridden aggressively (a task unlikely for the majority of the bike’s intended riders), the suspension lets you know that you’re asking too much of it by increasing the aforementioned harshness. The riding position for my 5-ft. 11-in. frame is a bit cramped in the legs but quite comfy on my upper body. I attribute this to the low 28-in. seat height. The saddle is comfortable and wide – which can be both a plus and a minus on the scorecard, depending on your body type. 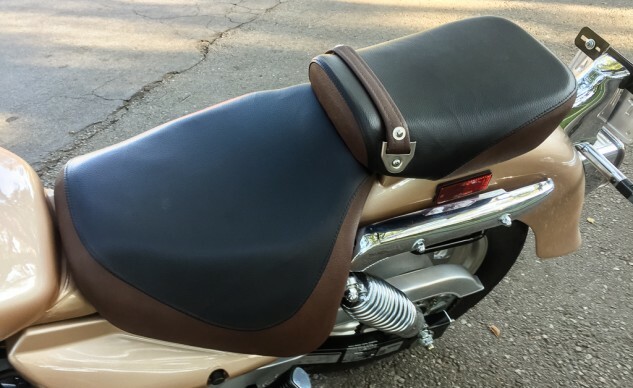 While the wideness makes it possible to move around to avoid buttock pain while riding, the width effectively increases the seat height for shorter-legged riders who need a more direct reach to the ground. 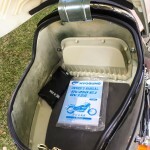 Similarly, the wide tank gives a good place to grip with the knees (unlike with bikes like the Sportster and its peanut tank) but contributes to a longer reach to the ground for short legs, which can sap confidence at a stop. The seat is comfortable, but its generous width makes for a longer reach to the ground. The Hyosung’s styling is a mixed bag. On one hand, people notice it. A neighbor who is a huge motorsports fan went out of her way to buttonhole me and inquire about that “beautiful champagne-colored bike” she’d seen parked in front of my house a few days earlier. Her comments were not the only time something like this happened. However, upon close inspection, the GV250 reveals several fit and finish issues, like the cheap, plasticy “chrome” dash and the body panel screws which are at an angle to the piece itself, making the screws look cross-threaded. However, no miscue is more inexplicable than the wiring for the oxygen sensor that juts out of the top of the rear cylinder’s exhaust right in front of the passenger peg. There’s even a poorly chromed 90° extension to the pipe’s heat shield to draw more attention to the black wire running in front of the frame and bodywork. 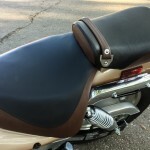 Then there’s the nice looking, two-toned seat which is surprising for a bargain-priced motorcycle. Hits and misses within inches of each other. 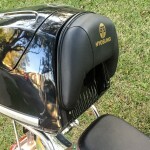 As is common with cruisers, Hyosung offers factory accessories for the GV250. Our test unit came with a windshield and a trunk attached. Since we were planning a shootout with another 250 cruiser, we removed these accessories for the bulk of the testing. Still the $110 windshield and the $185 trunk deliver convenience that a daily rider might appreciate for impressively low prices. 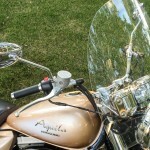 This factory accessory windshield expands the GV’s utility for a reasonable price. If you’re curious, aquila is latin for eagle – a cruiser monicker if there ever were one. 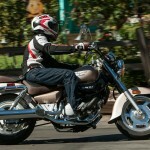 The Hyosung GV250 is a nice looking cruiser that offers comfortable accommodations for riders of average height. Shorter riders will like the riding position, too, but they may be put off by the reach to the ground at a stop. The GV250 offers decent performance for a few hundred dollars less than the Honda Rebel and V Star 250, and that’s saying something. The overall impression of the GV250 With a $3,999 price tag, a new rider can afford to purchase a new bike and ride it for a few years, gaining experience. 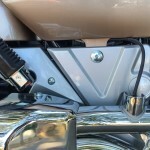 Additionally, the low cost of the factory accessories makes outfitting the GV for a rider’s planned use a reasonable proposition. When the time comes to move up to a bigger bike, they won’t be saddled with a big loan to get out from under. The GV250’s style looks like a bike of much larger displacement than it is, but its good looks are sullied by a few cost-saving issues. Still, the GV250 could be a good choice for a price-conscious new rider. Claimed Curb Weight 388 lb. Get price quotes for Hyosung from local motorcycle dealers.